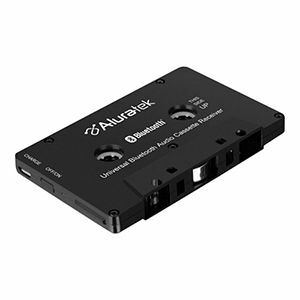 Aluratek's Universal Bluetooth Audio Cassette Receiver is the perfect way to transform your car's cassette player into a Bluetooth audio receiver. Perfect for vehicles that have an old stereo cassette player. Simply insert the cassette receiver into your car's cassette deck and pair to your smartphone, tablet or MP3 player. In seconds you can stream your favorite songs through your car's speakers. The Universal Bluetooth Audio Cassette Receiver features a built-in rechargeable battery so you can enjoy wireless audio streaming longer time on a full charge. The cassette receiver remembers up to four paired Bluetooth devices and will auto turn off within 5 minutes after disconnected from any device. You can also add Bluetooth receiving functionality to your old cassette stereos and walkmans. No need to throw out your old cassette deck stereos. Keep them alive with Bluetooth connectivity and enjoy the benefits of cable-free music and audio.